Centennial Campus at NCSU is the new home for the College of Engineering. Already, two engineering buildings are located on the campus. One houses the Department of Chemical and Biomolecular Engineering and the Department of Materials Science and Engineering. The second houses the Department of Computer Science and the Department of Electrical and Computer Engineering. 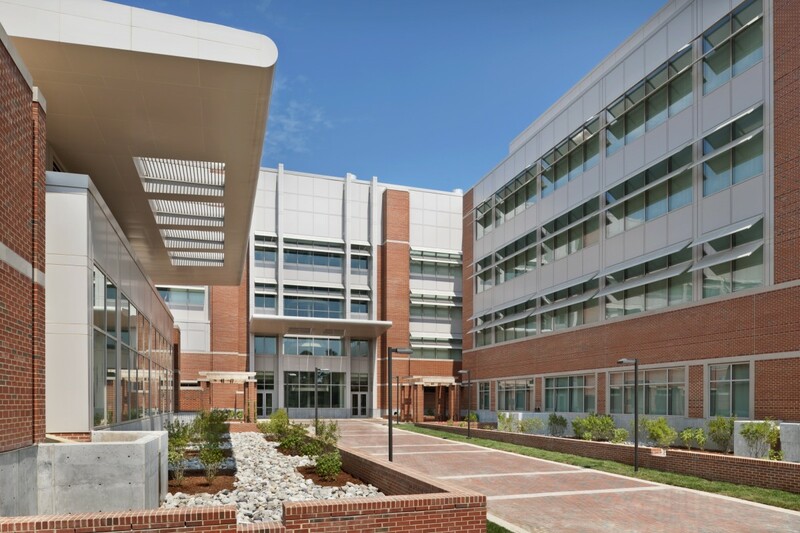 Engineering Building III is now home to the Department of Mechanical and Aerospace Engineering and the joint (with UNC Chapel Hill) Department of Biomedical Engineering. The four-story, 230,520 square foot main building includes approximately 80 laboratories, a wind tunnel facility, eight classrooms and offices for faculty and graduate students. There is also a separate 37,500 square foot high bay. Stewart was responsible for the structural engineering design. The main building is composed of reinforced concrete shear walls and includes a structural steel mechanical penthouse. The high bay consists of structural steel frames with composite slab. Due to the early submittal of the structural package, a substantial amount of time was devoted to construction administration. This project also required frequent communication with the architect, contractor, civil engineer and MEP engineer to ensure coordination of the structural drawings with the other disciplines.